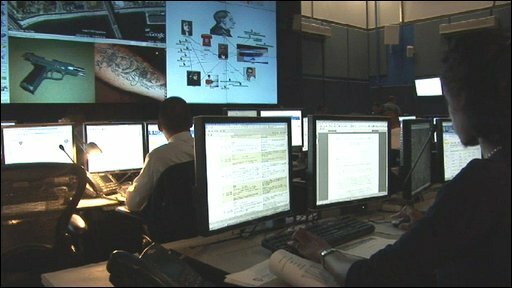 In the heart of New York Police Department's (NYPD) Real Time Crime Centre (RTCC), Inspector Kenneth Mekeel surveys data coming in on a giant monitor the size of a cinema screen. As queries come in from officers on the street he brings up different data streams and punches them back to the officers. Inspector Mekeel is on the digital front line of North America's fight against crime. He is also part of a new wave of policing which increasingly relies on technology and immediate access to digital information. The RTCC, for example, replaced piles of papers previously locked away in dusty cupboards. "The information was out there, but in paper form," he said. "I remember 30 years back utilising carbon paper and now it's all in databases." Analysts at the RTCC use a powerful search engine to search files across an undisclosed number of local, national and even international government and law enforcement databases. Public and internal police records, parking infractions, newly digitized citations, mug shots, photos of evidence, and the main open-source database - the internet - can be queried for intelligence. Police officers at the scene submit evidence data to the RTCC via their laptops. In turn the centre performs "link analysis", feeding back to the officers new leads for the investigation before they leave the crime scene. Web-like illustrations can be composed on multi-screens linking crime elements: Google maps with flagged locations, photos of witnesses, and weapons found at the scene. Links can be created tying suspects to addresses, family members, even photographs of tattoos taken during past arrests. "Criminals are being caught a lot faster with this information," said Inspector Mekeel. This may have contributed to the 8.8% drop in New York's murder rate over the last two years. "Over 18,000 cases that we've had since 2006 would have taken a lot longer and more personnel", he added. New York's murder rate has dropped almost 77.2% in the last 15 years, despite budget cuts. "Technology really is the key", said Inspector Mekell. In the small town of South Brunswick, New Jersey, for instance, mobile phones have become tracking devices. When someone dials 911, within seconds, the emergency response service retrieves the caller's phone number, wireless carrier, and location. This technology has proven extremely useful when callers are unable to give emergency responders their exact location. On other parts of the east Coast, police are increasingly using CCTV cameras. Newark, for example, has deployed a wireless high-speed network. "It's real-time. It's not choppy at all. It's phenomenal feed", explained Peter Lutz, Newark's director of Police Management Information Systems. During the last three years, 110 cameras have been deployed in a city measuring 61 sq km (23 sq mi). "Police Officers are all over the city responding to all types of calls; these cameras give them 110 extra eyes, that's the way I look at it. "And you know, we're just gonna keep adding more cameras as we go", he said. With the high number of cameras, most are kept on automated tours, surveyed by the centre's two or three monitors. "Believe it or not, we pick up a lot of random incidents on these random tours". 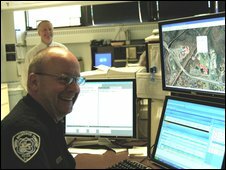 If a monitor suspects a criminal event, an officer is dispatched. monitoring areas that may not be currently patrolled because officers may be on other assignments," said Mr Lutz. However, critics argue that surveillance and data aggregation technologies -'dataveillance', as some researchers have defined it- do not deter criminals or help solve crimes and puts privacy at stake. 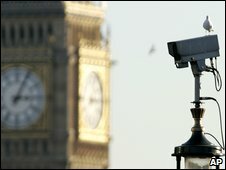 A report into London's surveillance network found that in 2008 more than a million cameras helped to solve just 1000 crimes. That is one crime for every thousand cameras. Chris Calabrese, counsel of technology and liberty at the American Civil Liberties Union (ACLU), said innocent people should not be watched. "If you are a law-abiding citizen in this country and no one has any reason to believe that you are doing anything wrong, law enforcement should not be watching you". However, he admited that law enforcement agencies are just doing their job. "This is not law enforcement's fault. It's their role to use every tool available to them to find criminals. "It's our job as a society, and it's the lawmakers' job, to tell them where the line is and what's the balance between privacy and security," he said.